Thank you for considering Press Club to host your private event. A hosted event at Press Club offers a unique, distinctly Northern California wine country experience for you and your guests. With 9,000 square feet of design award-winning space (our architects are the proud recipients of two AIA awards for “Best Restaurant Design”), we can handle events of any scope and size, from sit-down dinners for 20 to meet-and-greet happy hours for 50 to gala affairs for 300-500+. Our chic venue, thoughtfully curated and distinctly Northern Californian wine list, scrumptious menu pairings and unparalleled service will help you create a party your guests won’t soon forget. HOW DO I GET TO PRESS CLUB? As Press Club is located at 20 Yerba Buena Lane, a pedestrian walkway located between Market and Mission and 3rd and 4th Streets, the most convenient way to get to Press Club should you be driving is to input the following into your GPS (or Google Maps): 217 Stevenson Street, accessed from Third Street. This will bring you straight into the valet area for the Four Seasons. You can choose to valet your car with The Four Seasons, or take a sharp left prior to entrance into Jessie Square Garage. If you are valet parking at the Four Seasons, walk through the lobby and out onto Market Street. Take a left past St. John and Hickey Freeman retail stores and then another left onto Yerba Buena Lane (unmarked). Press Club is down Yerba Buena lane on your left. If you are parking at the Jessie Square Garage, the elevator will take you up to the plaza next to St. Patrick’s Church. Exit the elevator and take a left and then another left away from the square. Once you have reached Yerba Buena Lane (the entrance to the Marriot will be right in front of you) and a right at the Jewish Contemporary Art Museum. Press Club will be on your right. Take the Bart of Muni to the Powell Street Station. Exit via the Yerba Buena Gardens stairwell which feeds out onto Market Street. Walk past the Coffee Bean and Tea Leaf, take a right onto Yerba Buena Lane (unmarked). Press Club is down the lane on your left. Let your driver know that you are heading to the Four Seasons Hotel, located at 757 Market Street between 3rd and 4th Streets. He or she will let you off in front of the door to the Four Seasons Hotel. If you are facing the front door to the hotel, take a right past St. John and Hickey Freeman retail stores and then a left onto Yerba Buena Lane (unmarked). Press Club is down the lane on your left. WHERE CAN I PARK? VALET? Garage elevator takes you up to plaza. Take a sharp left, another left and a right at the Jewish Contemporary Art Museum. Press Club will be on your right. Note: The main entrance of the Hotel (and valet area) is located at 217 Stevenson Street, which is accessed from Third Street. GPS drivers should input 217 Stevenson Street as their destination. WHAT IS A HOSTED EVENT? A hosted event at Press Club is one where the event costs are covered by you or a designated host. In order to reserve a private or semi-private space in our venue, a pre-ordered wine minimum and site fee (with the exception of our lounge bookings which only have a wine minimum) is required. Your wine minimum is dependent on the area of the venue you are looking to reserve. Wines for your event will be arranged via our events office prior to your booking and available for you and your guests when you arrive. There are myriad options should you wish to enjoy Press Club without committing to a pre-spend in wine or a site fee. Please see the Non-Hosted Events section of our website for more information. I WANT TO HOST AN EVENT? HOW DO I GET IN THE BOOKS? The best way to get an event started at Press Club is to submit an event inquiry on our website. See our events section for more info. Once you have discussed your event needs against the various areas in our venue with one of our event representatives and have decided that Press Club is the place for you (cheers! ), we will ask you to put down a deposit (deposit amount will vary based on area of the venue you are looking reserve). This can be done via credit card or check made out to YBL Hospitality Partners, LLC. We will also ask you to sign a basic event contract. Once we have all of this, we can get started on the fun stuff – planning your event!! HOW LONG CAN MY EVENT LAST? Our wine minimums and site fees are based around a 3 hour event. We are happy to have your event last longer than 3 hours should you wish. Additional charges apply. We have a delicious, wine friendly catering menu from which you may select the food you wish to serve at your event. Our culinary partner will work with you to create the perfect offering for your guests within your budget. Our wine director and team will then pull together your wine list to create the perfect pairing experience for your guests. Please note that Press Club does not allow food to be brought in for events. Stuff happens and we understand! Should you need to cancel your event, please see below for our applicable cancellation terms. Deposit is non-refundable and is forfeited in the event of cancellation. In the case of full cancellation, the cancellation fee is payable within thirty (30) days of the date of cancellation after which time the cancellation fee will bear interest at the rate of 1.5% per month (18% per annum) until paid, unless this rate exceeds the maximum rate permitted by applicable laws, in which event the maximum legal rate shall apply. The deposit paid by the Client will be applied against the cancellation fee owing. Yes! We have 30+ beers on tap. We offer delicious, premium Northern Californian wine and beers but no liquor at this time. CAN I BRING MY OWN WINE? HOW ABOUT FOOD? As we are a wine bar and lounge, we do like to have our guests enjoy those items we think best represent our brand. Our carefully curated wine list and food pairings are truly among the best to be had in the city and we pride ourselves in our offerings. As such, we do not allow any food or wine to be brought in by our guests. Having said that, should you wish to bring in a cake, we would be happy to cut and plate it for you. There is a $2.50 per person cake cutting fee. Yes! There is a ramp that leads down to our entrance from street level, as well as an elevator within the venue to go between floors. Yes! You are more than welcome to include your little ones in your event. We only ask that you do not provide them alcohol and that they do not disturb our other guests. CAN I HAVE ENTERTAINMENT AT MY EVENT? Yes! 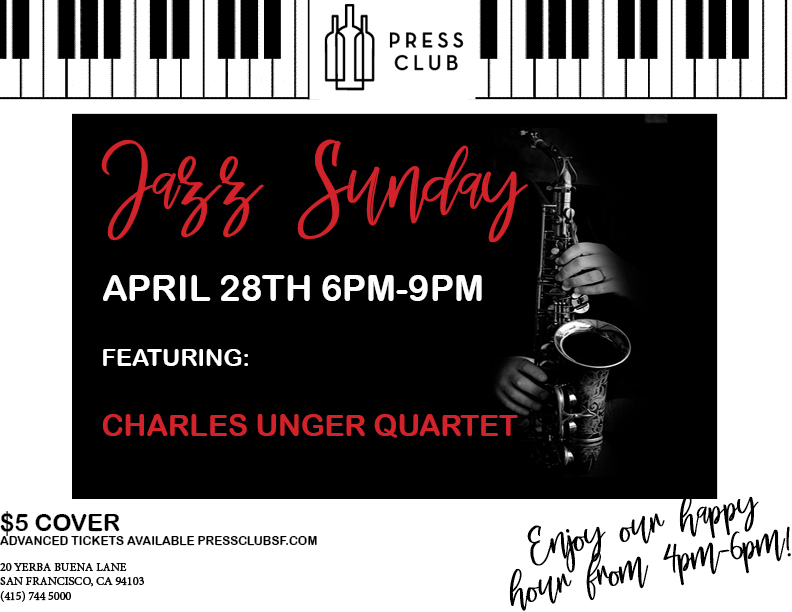 Press Club is a great venue in which to provide live music and entertainment. We have a variety of live music options at our fingertips. Just ask and we will be more than happy to make some recommendations. Please note that live entertainment can only be brought in during a full buyout of our venue. Otherwise, nightly music is provided by Press Club. While Press Club is a gorgeous venue “as-is” in which to host an event (there’s a reason why we have won two AIA Awards for “Best Restaurant Design”! ), it is also a space that responds beautifully to floral arrangements. We work closely with several Bay Area florists and would be more than happy to make a recommendation. Site fees, wine minimums and any food your wish to order are subject to tax (8.5%); Food and beverage totals are subject to a service charge (22%). This service charge is in lieu of your tip. A Healthy SF Tax (5%) on any food and beverage ordered will also be added to your final bill. This service charge and these taxes are subject to change without notice. All hosted events include complimentary coat check and optional check-in table. Education, floral services, live music or DJ services and specialized chair, linen and china rental are available upon request.